Short digital scrapbooking tutorial videos to share some digital scrapbooking tips and techniques to improve your digital scrapbook layouts. I was designing my Word Art Freebies for the WorldWide Christmas Scrapbooking Freebies extravaganza that kicks on on December 1. And I thought it might be handy to share a few tips with you how you can create Word Art yourself. Some time ago I made a mini video tutorial to give you a basic starter in doing it. And that was very popular. Here it is again. Please note: I no longer publish the Word Art Newsletter mentioned at the end of the video. I now offer the Garden Party mega Scrapbook Kit Download instead. Inspiration boosters tol help you create extra special Word Art designs. When you’re selecting your fonts for a piece of Word Art try to mix fancy fonts with plain fonts. The contrast usually works well. Use graphic elements such as flowers to replace some letters. To do this you split the work into two and type each part on a separate layer, leaving out the letter that you’re going to replace. Then assemble your word, leaving a space between the two parts for you to insert your flower. Experiment with your layer styles. Try making the drop shadow on a word in a contrasting color, rather than trying to make it look natural. Use the Complex and Pattern layer styles on words to give them a really funky look. All words don’t have to be horizontal. Try turning some words on their side when designing a phrase. This works particularly well with short words like ‘and’ or ‘the’. Use brushes to stamp background shapes behind your phrase . . . on a separate layer of course. and then reduce the opacity so that it’s just a hint of pattern and doesn’t detract from your words. And most of all . . . don’t be afraid to go a bit over the top. Word Art is heaps of fun to create and to use. And it’s not just for digital scrapbook layouts. You can print out your Word Art and then cut it out to use on your paper scrapbooking layouts and cards. Try making the sentiment for your next card in Word Art. It’ll look absolutely fantastic. So do you already create Word Art yourself? Or do you think it might be something you would give a try? Let me know what you think in the comments section below. And if you have any tips of your own for making Word Art that you’d like to share I’d greatly welcome them. I’m very excited about some big changes that are happening over at my Step by Step Digital Scrapbook website and I can’t wait to share them with you. If you’re a regular reader here you may recall that I started Step by Step digital Scrapbook a couple of years ago to help newbies who wanted to get started in Digital Scrapbooking. One of the things I offered was a mentoring program to help newbies develop their skills from absolute beginner to advanced digital scrapbooker through weekly video eClasses. Each eClass demonstrated the creation of different scrapbook layouts using different techniques. And each weekly class came with a complementary digital scrapbook kit. Well over the past year or so many visitors to the site requested that I make the tutorial videos available to more than just newbies. So I have decided to change the site from a membership mentoring program to a more a-la-carte style. Now, instead of joining as a beginner and working your way through the program, you can pick and choose what interests you. You can still start at the beginning and work your way through if you wish. But if you already know the basics of digital scrapbooking and you want to learn some more advanced techniques and tricks you can browse through the Intermediate Tutorial Section or the Advanced Tutorial Section and select the ones that tickle your fancy. I love your tutorials. You provide anxiety-free instruction from downloading tutorial and kit directions to saving our new masterpieces! Each skill that you provide comes with clear, concise directions. I am a visual learner and you make things very easy to grasp. I never feel like you are trying to sell me on this and that. You are a very sincere person who simply loves to share the joy of scrapbooking and you do that with ease. The beautiful kits that accompany each tutorial are fantastic and I am enjoying being able to use them as I follow along with your instruction. The ability to follow along, step by step, is wonderful. Your support is amazing. If I have any questions or concerns you are an email away and always quick to respond. Each tutorial is presented in two videos totalling between 30-60 minutes and demonstrates all the steps to creating the pictured digital scrapbook layout. And each Tutorial comes with a complementary digital scrapbook kit so that you can jump right in and make your own version of the demonstrated layout. In fact, pausing the video whilst you create your own layout step by step is a great way to learn the techniques. With this change comes a 50% reduction in cost! 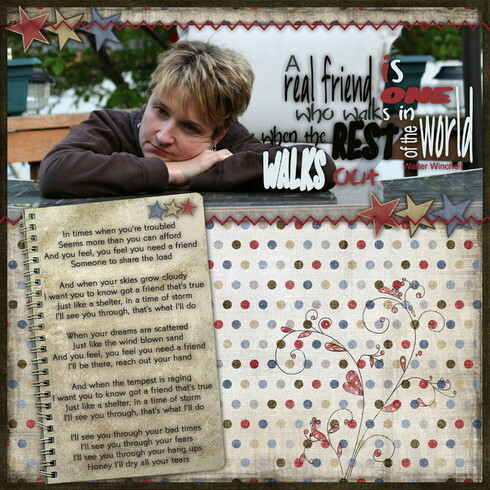 Step by Step Digital Scrapbook Beginners Tutorials, Intermediate Tutorials and Advanced Tutorials . When I do digital scrapbook layouts these days I rarely use pre-made alphas. I find that there are so many great fonts that I can use with my Photoshop Elements type tool. And more importantly there are so many great techniques I can apply to them that will give an extra edge to my title. One thing that I love to do is to give my title a reflection. There are a couple of ways to do this and in my Step by Step Digital Scrapbook Mentoring Program I teach both a simple and a more complex approach. But if you’ve never tried it, I thought this snippet from one of the Step by Step Digital Scrapbook eClasses might be useful. We join the eClass just after cutting our title out of a piece of patterned paper. Well I’m no different and so when Egel dropped me an email to point me to a layout she had posted at A Cherry on Top I was totally stoked. And I particularly liked how Egel has coloured part of the word art so that it matches the colors in the rest of her layout. For me that’s one of the many joys of digital scrapbooking: being able to customize elements so that they coordinate with whatever layout you’re doing. Anyway, full praise to Egel and if you have a liking for word art and haven’t signed up to my fortnightly Word Art Newsletter, why not put your details into the box at the top of this blog and you’ll receive my newsletter with a ramble from me, updates on Scraps of Mind and three pieces of original design word art for you to use in funky ways, such as Egel has. And if you’d like to give it a go yourself, here is a video I made earlier this year showing you how to do it. I actually recommend that rather than viewing the YouTube version, if you have a reasonably good Internet connection, you click on the High Resolution version which is much easier to watch than the YouTube one. Click here to watch the High Resolution Version of this Tutorial. If you like this tutorial, please give it a Stumble and maybe click over to YouTube and give it a rating. Today we’re going to look at how you can ensure that you receive the email newsletters that you sign up for. Have you ever signed up to receive a newsletter and then found that nothing happens? Well you might have typed in your email address incorrectly, and that’s a whole other story. But if you did type your email address correctly then chances are it’s because your email system think that it is unsolicited, unwanted advertising email and in its efforts to protect you, it has tossed your newsletter confirmation email in the junk mail. Let’s face it most of us never think to regularly check our junk mail, so there it will sit until your junk box does its regular clean out. Frustration for you and frustration for the newsletter producer. And I speak from personal experience here. I could weep when I see all the would be subscribers to my Word Art Newsletter who are listed as Unconfirmed because my email to them requesting confirmation of their subscription has been considered spam by their email system. White List the email addresses of the Newsletters you want to receive. Well most email systems have a way that you can identify an email address as a ‘good guy’ so that they will allow emails from that address to get through. karooch(at)scrapsofmind(dot)com if you want to receive the Weekly Word Art Newsletter. Unfortunately all email systems are different (wouldn’t you know it?) so it might take a bit of checking in your menu bar to find the way it works for yours. But here are some instructions for some of the more popular ones. Click in the text box next to that pull-down menu, then enter the address in the “From” line of the most recent email from the site you want to white list. In the space provided, enter the address in the “From” line of the most recent email from the site you want to white list. Add the email address of the site you want to white list to your contacts list by choosing Add Contact from the list of options on the left. Select the screen name that your emails are being sent to. For AOL version 9.0: You need to add the sending address to your “People I Know” list. Open your latest email from from the site you wish to white list. to your “People I Know” list. AOL version8.0: Select Allow email from all AOL members, email addresses and domains. For AOL version7.0: In the section for “exclusion and inclusion parameters”, include the site you wish to white list. So I hope that has helped some of you who might be feeling a bit annoyed with newsletters that never arrive. And if you’re someone who has signed up to the Scraps of Mind Word Art Newsletter and not received one, then please try again and white list my email address to I can break thought your email protection shield. Let your Blog Stumble – it won’t hurt.